Despite this extraordinary sight – and the riddle of why the snake crossed the road – we don’t touch our brakes. It seems a shame to disrupt our momentum. A road surface this pristine and empty is somehow just as impressive as the show of nature unfolding in its gutter. Since leaving Cadiar we’ve seen only two vehicles during the entire 18km descent to the bottom of the valley. The white lines look as if they were freshly painted this morning, yet the A348 is the main artery for this entire region. This lack of traffic will become the hallmark of our day. We are less than an hour’s drive from the ugly modern tourist resorts and industrial-scale polytunnel farms of the Mediterranean coast, and yet seem to have stumbled into a parallel universe where they never got round to inventing the combustion engine. 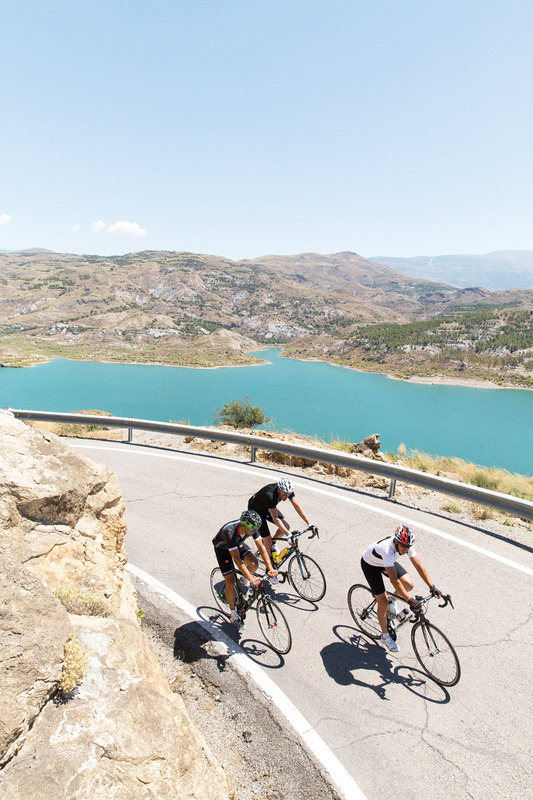 We started our ride at Cadiar because it is geographically the heart – or as writer Gerald Brenan described it, ‘the belly button’ – of Las Alpujarras, the range of medium-sized mountains that separates the Sierra Nevada from the Mediterranean Sea. It’s also where Gary and his wife Sarah run their cyclists’ B&B and guided rides business, Vamos Cycling. 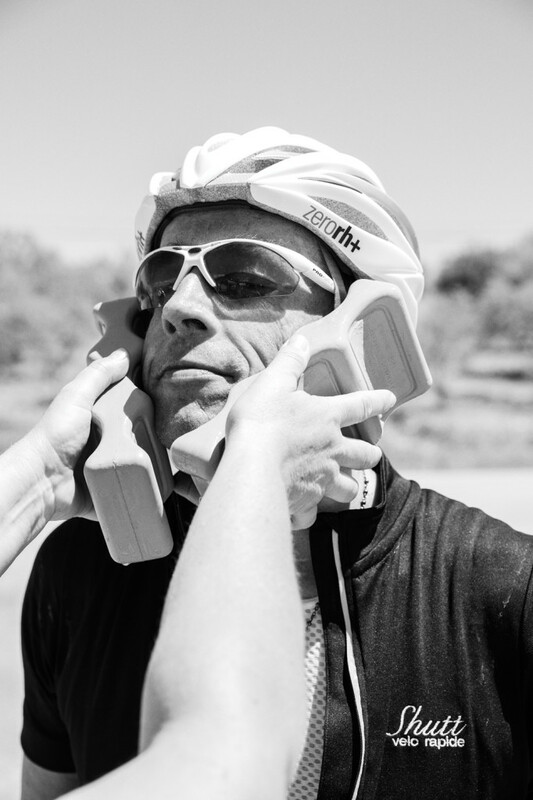 Gary is a veteran of some of Spain’s toughest sportives, all bearing suitably macho names such as ‘The Suffering’, ‘The Limit’ or ‘The Bonecrusher’. 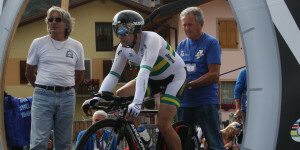 Last year he logged 300,000 metres of climbing. But he has promised to keep the pace easy today. Joining us is his friend and local farmer Ramon ‘Ricky’ Martin, who has already told me he thinks my broad, 90-kilo frame would be better suited for helping him in the fields – ‘I can pay you in beers’ – than toiling up some of the climbs awaiting us today. There are few stretches of flat road in this area, but Gary has cunningly managed to devise a loop that starts and finishes with lengthy downhill sections. 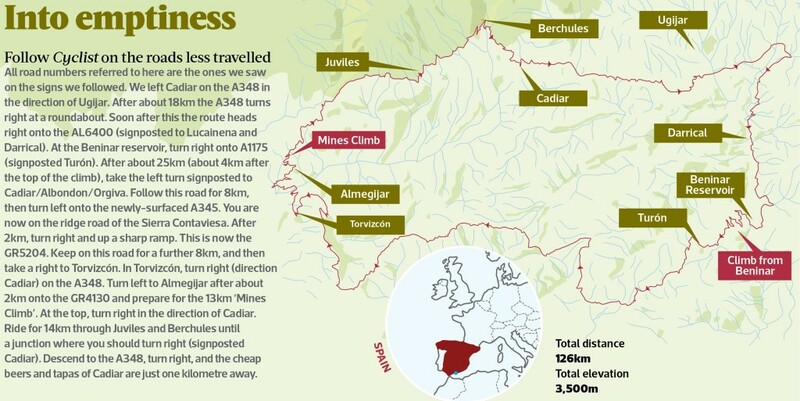 We’ll worry about the 3,500 metres of climbing in between when we come to them. Another point of concern is the heat. Because the photographer Paul didn’t arrive until 4am this morning thanks to striking air traffic controllers, we have started the ride quite late – after 11am – and the mercury has already nudged past 30°C. 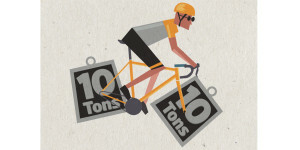 During the course of the next 126km, I will consume nearly 10 litres of water and lose 3kg in weight. The Alpujarras region really does live up to the label ‘undiscovered’. Even the Spanish weren’t in any hurry to live here, preferring Granada and its fertile plains to the north or the Mediterranean coast and its rich fishing grounds to the south. The mountains in between just seemed like too much hard work. Plus there was the little matter of the invading Moors from North Africa to deal with, but we’ll come to them shortly. and who carried it out. This magazine once described Mallorca as ‘the island that proves God was a cyclist’. Well, Las Alpujarras is the region that proves that heaven’s Head of Engineering is a damn decent chap too. The narrow AL-6400 twists and rolls gently between craggy outcrops of rock and scattered clumps of trees before emerging into a wide valley alongside a dried-up riverbed. We pass through two villages, seemingly deserted and shuttered up against the heat, before the road starts a gentle, sinuous descent towards the glistening expanse of aquamarine that is the Beninar reservoir. Beyond that is the first obstacle of the day: the 22km, 1,000-metre climb to the top of the Sierra Contraviesa. We turn right and cycle over the dam, where the breeze off the water provides welcome respite from the heat. But it’s short-lived. We are soon ascending abruptly through a series of tightly-packed hairpins and leaving the reservoir far below. Eventually we turn our backs on the reservoir and valley for good. A short drag brings us to the pueblo blanco of Turón, whose narrow, empty streets, beautiful churches and colourful flowers belie its turbulent history. Yes, those dastardly Moors were here, though to be fair to them, their conquest of Turón was apparently a gentle one, with the Christian inhabitants being granted safe passage down to the coast, and it was the resurgent Catholics who shed the most blood when they eventually recaptured the place. Of more pressing concern to us, however, is whether that dark, open doorway with the poster of assorted helados on the wall is a bar and potential snack stop or not. It is. We pile in and discover an open-air terrace in the back which not only affords an uninterrupted panorama of the village but also serves the finest bocadillos de jamon y tomate this side of a Team Movistar musette. Calories replenished, we walk around the corner to the Ermita de San Marcos – whose whitewashed walls and twin, tiled-roof towers look like something out of a spaghetti Western – to refill our bottles at the public fountain. But a hovering, buzzing cloud makes us think twice. ‘They’re water-carrying bees,’ says Gary. Up until this point, all I know of Gary’s CV is that it includes spells as a carpenter, amateur motorbike racer – during which he won two trophies in the Supersport 400 class before a crash at Brand’s Hatch made him switch to cycle racing – and guitarist in a heavy metal band called Repentance who won rave reviews on the Guildford pub circuit. But now, for the second time in just a few hours, he is going all David Attenborough on us: ‘Yeah, they’re working for the queen. They take the water back to the hive for her.’ We, meanwhile, are forced to fill up our bottles back at the bar. The road continues upwards and we’re able to appreciate Turón’s strategic location amidst all this relentlessly rolling countryside. After the Moors were booted out, it took the Spanish king some time to persuade his countrymen to return to Las Alpujarras. Today, the area is full of olive and almond groves, pig-breeding farms and the odd vineyard, yet the population is still tiny. Turón has only 300 inhabitants, while Cadiar boasts barely 1,000 full-time residents. The mass tourism of the Costas is just a distant rumour up here, which is great news for the intrepid cyclist as it means empty roads – so far the ratio of drivers/reptiles encountered remains at 2:1 – and cheap prices. At the end of our ride back in Cadiar, for example, half a litre of beer with a generous portion of tapas will cost us only three euros each. Like a discarded ribbon, the road continues its upward trajectory through the fertile landscape. I don’t know whether it’s the sun or the sugar rush from a can of Coke, but I get a sudden urge to launch an attack for KoM points, even though there’s still well over 10km of climbing to go. It ends farcically when I can’t squeeze past the support vehicle, but at least I got my sponsors a couple of minutes at the front of the peloton. Soon we catch our first glimpse of the Mediterranean Sea to our left. And then, an hour after leaving Turón, we arrive on the ridge of the Sierra Contraviesa, the backbone of the Alpujarras. At this point, we are in for a shock. Unlike its civic-minded counterpart in the valley below, the local ayuntamiento hasn’t quite got round to putting any of its EEC highway maintenance grant to good use. From gliding over a surface as smooth as the Siberian pine of an indoor velodrome, we now find ourselves bouncing over a road straight out of a cobbled Classic. After about five kilometres of this, a left turn brings us back on to the smooth stuff. In fact, this is the newest section of road in the region, having been resurfaced just a few months earlier, Gary tells us. A couple of sharp ramps take us up to the highest point of the ridge, where we are rewarded with endless vistas on either side. To our left, the coastal plains and Mediterranean Sea (and is that smudge on the horizon Morocco?). To our right, the snow-capped peaks of the Sierra Nevada, including mainland Spain’s highest mountain, the 3,478m Mulhacen, and the slightly smaller Pico del Veleta, home to the highest paved road in Europe (which Gary would be tackling in the El Limite sportive the following week, snow permitting). For the next 10km it feels as if we are cycling on the roof of the world, or at least its humble conservatory extension. Photographer Paul thinks this is the ideal place to strap another few kilos of kit to my bike in the shape of his hefty digital SLR camera, which he will operate remotely from the support vehicle. He doesn’t seem concerned that the rivers of sweat pouring from my face might cause it to short-circuit. Nor does the realisation that the slightest misjudgement on my part could write off $12,000-worth of camera equipment dampen my enjoyment of the next few kilometres. It’s a pure adrenalin rush. Any photographs on these pages showing Gary and Ramon crouched low with the tarmac reduced to a blur beneath them are a testament to my fine eye for composition as well as my superb bike handling skills. Eventually we reach the turn-off for Torvizcón where the road plunges back down to the Guadalfeo valley and the A348. Paul wisely removes his camera from my handlebars and I am free to do my best Vincenzo Nibali impersonation, my heavier frame carving a nice smooth tunnel through the air for the two 70-kilo striplings behind me. Gary has warned me it gets quite technical towards the bottom, and sure enough the last couple of kilometres are a series of corkscrewing hairpins that demand total respect. Adding to the challenge is the very last bend that, thanks to God knows what calamity or local council budget deficit, has no apparent surface at all, just a layer of jagged rocks that seemingly protrude directly from the earth’s molten core. 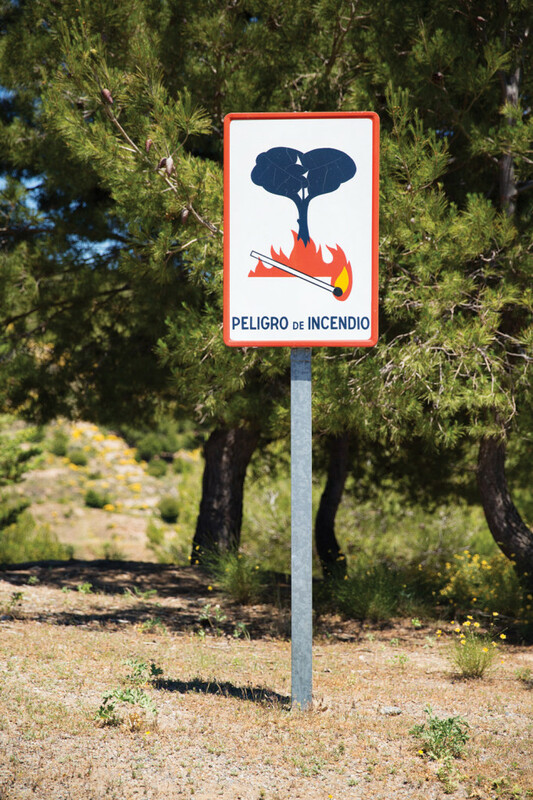 In the village of Torvizcón, I learn the hill we have just descended from is called the Cerro Salchicha – Sausage Hill – in tribute to the local species of pig. Unfortunately, we don’t get to sample any. Because of our late start, we’d arrived at the village bar during the no-man’s hour between lunch and dinner, and all that’s available are some hastily-improvised tuna and tomato rolls. But that’s OK. I’m so hungry I could happily eat a brick. Soon after leaving Torvizcón in the direction of Cadiar, we veer off onto the A4130 which zig-zags down to the valley floor. We cross the river Guadalfeo and it is there, just beyond an overhanging cascade of wild flowers, that the testing ‘Mines Climb’ begins. 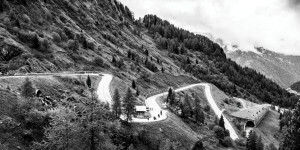 It will ascend 900 metres in 13km at an average gradient of 6.3%, with the worst bits – ramps of 11 and 13%– reserved for the final couple of kilometres. It is now almost six o’clock, and it still feels as if I’m cycling in a furnace. We are surrounded by mountains and trees, but there’s no shade! It doesn’t help that the road begins its traverse up the mountain in a series of lengthy zig-zags that are aligned east to west, meaning the sun is either directly in my face or on my neck for the first half of the climb. By the time we pass the village of Almegijar about halfway up, I’m lagging behind my companions, deeply regretting my kamikaze attack on the earlier climb. My legs and lungs are working fine, I just feel as if I’m melting in the heat. and troughs take on richer, deeper hues. The road swings left and my Garmin gives me the news I have been dreading and yearning for in equal measure: I’m almost at the top. And sure enough, just around the next hairpin – where I suffer the ignominy of being given a push by Sarah from the car who has obviously mistaken my ‘energy conservation’ mode for a ‘please God make this end’ grimace – are the final, fearsome ramps Gary had warned us about. From a distance, they appear like two harmless ripples in the beautiful, smooth tarmac, but up close, as the road threads its way through the stumps of a former lead mining camp, they are transformed into mini tsunamis. I haul myself out of the saddle, grit my teeth and grind the pedals until eventually the gradient slackens off for the final kilometre. ski resort) and famous for its Serrano ham – or heading right for the final 20km back to Cadiar. In the end, the receding light makes up our mind for us. Though largely downhill, there’s one significant lump to be scaled on the way home, so we decide to get on with it. On the way, photographer Paul says he’d like some shots of us in full-on descending mode: ‘On the drops, looking professional, with no looking around at the view.’ This last instruction sparks a debate, which continues over beers and tapas long after we have completed the final, sweeping descent back into Cadiar. Gary, who had finished seventh overall on the previous month’s 200km, 4,000m Spanish sportive called La Sufrida, admitted he’d spent most of it hunched down on the drops rather than admiring the views. But he still despairs at riders ‘who come out here and don’t take a single photo the whole week, as they are too busy looking at their Garmins’. To me, a defiant non-racer, enjoying the view has always been part of the attraction of cycling. Throughout today’s ride, I’d regularly been taking photos of the scenery as I pedalled, although admittedly I was enjoying that early descent far too much to stop and take pictures of the four-foot long snake devouring a mouse. And that’s the dilemma for cyclists visiting Las Alpujarras. The scenery is so striking, it’s hard not to enjoy the views. But at the same time, the roads are so enticingly smooth that it would be the easiest thing in the world to shut out your surroundings and concentrate exclusively on the thrill of the ride.